South Korea and Saudi Arabia agreed to expand their bilateral cooperation in energy, healthcare and medical sector. The Ministry of Trade, Industry and Energy announced Wednesday that minister Sung Yun-mo met with Mohammed Al-Tuwaijri, the minister of Economy and Planning of Saudi Arabia, on Wednesday, to discuss ways to strengthen their economic ties under the Middle Eastern country’s Vision 2030 that aims to reduce its economic dependence on oil and diversify industries. South Korea is one of the key partners of Saudi Arabia who wants benchmark the country’s fast economic development and industrialization. The two nations have been implementing 40 or more joint projects in many sectors including manufacturing, energy, digital, infrastructure, healthcare, life science and investment. At the second round of meeting for the vision on Wednesday, the two countries agreed to extend cooperation in test certification of energy saving equipment based on a memorandum of understanding between Korea Conformity Laboratories and Saudi Arabian Standards Organization. Korean bio and healthcare companies also formed a business partnership with their Saudi Arabian counterparts. Samsung Engineering signed a business agreement to help construction of medical equipment manufacturing facility in Saudi Arabia, and Genius pledged to support genome research and analysis. Pangen Biotech inked a license deal to allow Saudi Arabia to sell its biosimilar to Gulf Cooperation Council members. The two sides also vowed to enhance cooperation in the auto sector, health insurance, ICT, smart city and airport, and further explore ways to join forces in the nuclear energy sector. 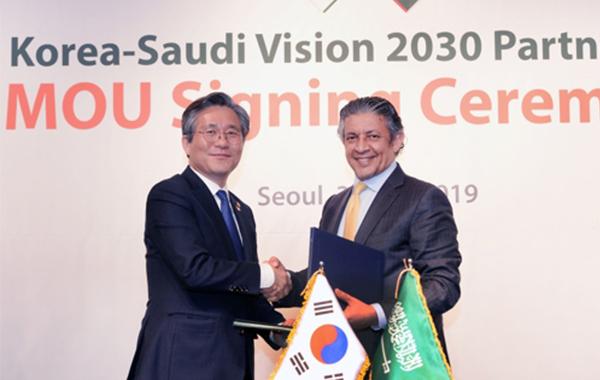 Saudi Arabia decided to set up an office in Seoul to facilitate collaboration of the two countries for Vision 2030.